What is a Variable? VBA macro variables. This blog explains the nuts and bolts of Excel VBA variables, including how to declare them, how to set their scope and all sorts of other tips and tricks. The blog also covers constants in Excel macros. This blog is part of our Excel macros online tutorial series. Alternatively, we run training courses in the UK in Excel and also in Visual Basic for Applications (and are always looking for partners in the US or other English-language countries!). 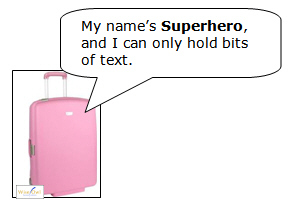 In the example shown in part one of this blog, we want to store the name of our superhero and the rating applied to them somewhere on your computer which is easy to access and use. That somewhere is called a variable. A variable is a bit like a suitcase, in that it stores something. But there are two big differences: suitcases don't (usually) have names, and they're not restricted to storing just one thing. So if you're the sort of person who names their suitcases and stores just one thing in each, you'll find variables strangely familiar! Our variable to hold the superhero name. 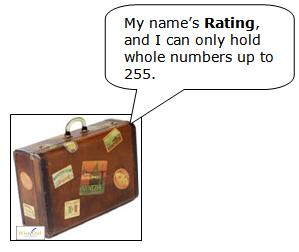 The variable to hold the rating. So know we know what variables are (!) - how to create them?